Canadian Pianists Bernadene Blaha and Kevin Fitz-Gerald are internationally recognized as gifted recitalists, orchestra soloists and chamber musicians, appearing in major concert series on world-renowned stages. Their individual careers are well established and have included collaborations with Rivka Golani, Camilla Wicks, Stephen Isserlis, Lynn Harrell, Anne Akiko Meyers, the Orford, St. Petersburg and St. Lawrence String Quartets. Collectively they have appeared throughout Canada and the United States and have been invited to perform at music festivals in Banff; Newport, Rhode Island; Tucson, Arizona; La Jolla, California; Round Top, Texas and San Miguel de Allende, Mexico. Their discographies include CDs for CBC, Summit, Analekta, Quatro Cordes, TWF and Round Top Records. Collaboration in the four hand and two piano repertoire arose from an invitation to tour classical music for the Royal Viking Cruise line shortly after they were married in 1987. These excursions took them to China, Japan, Korea, Hawaii and the Mediterranean and were so successful that the artists expanded their repertoire to include the major works for four hands and two pianos. Since that time they have appeared together as orchestra soloists performing two piano concerti by Mozart and Poulenc as well as the Grand Pianola Music by John Adams. They have also toured as an ensemble for the “Piano 6” project and “Cross Country Classics” in Canada and have received generous support from The Canada Council. In March 2000, the duo performed the world premiere performance of Elizabeth Raum’s 4 Hand Sonata which was commissioned for them by the Tucson Winter Chamber Music Festival. 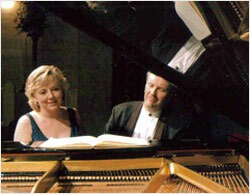 Currently based in Los Angeles where both pianists serve as faculty members at the University of Southern California’s Thornton School of Music, their teaching experience includes workshops, master classes, adjudication and a mini-residency package of concert and master classes at major Universities, Colleges and Conservatories. "Beautifully matched, the duo presented a jewel case version of this amiable work, the finger work crystalline and pert, the lyrical moments treated with sensitivity and grace, and the final movement simple, unbuttoned fun"
"They synchronized the keyboard sonorities with winning elan, whether in delicate passages or in the stirring finale, brimming with chordal splendor"
"One of the Festival’s best overall evenings was a piano recital with Blaha and Fitz-Gerald. Piece after piece, the playing was exquisite, capturing all nuance of style and color in a program that spanned a century-plus. It was their near telepathic connection in the four hands work that most impressed, their phrasing melded so completely as to sound like one player"
"Piano duo dazzles at Sanderson. Together they play as one -- in time, in tune and obviously enjoying the music they are performing." "Seemingly on fire, Blaha would soar whenever Fitz-Gerald dipped, or ramble delightedly while her husband supported her with an underlying tone. The result was superb: Brahms never sounded more alive and compelling." "Their pianism was nigh impeccable: phrases lightly salted with barely perceptible hesitations so the music flowed freely but never sounded glib. The pianists, husband and wife, evinced a joyous rapport ‑‑ who can turn a phrase more smartly, open up its expression more subtly, pick up the tempo even a little more? This was Mozart at his most abundantly creative, one wonderful thing after another. The performance delivered all its pleasures." "Musical sparks shimmered and whirled through the TCC Leo Rich Theatre last Tuesday with spectacular, sometimes frenzied speed, as husband-and-wife pianists Kevin Fitz-Gerald and Bernadene Blaha blazed through a thrilling recital."